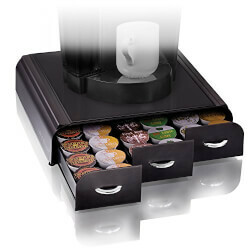 A drawer that fits under your coffee machine and stores all your pods! Great for any office or home kitchen that uses a single-serve coffee maker. Comes in different models, so it doesn't matter if you use K-cups or Nespresso capsules.